We first look at how this demo program runs, from the user perspective. The demo app was run in the emulator and screen shots were taken of the emulator as the app was run. The functions of the program are simple – add an item, find an item, list all items, and erase everything. To add an item, enter a “tag” value and then enter a value that corresponds to that tag. For this demo, I pretended this is a simple “Task list” manager and I eventually entered 3 task items, using the task name (task1, task2, task3) as tag names, and a brief description of each “task” as the data value. Erase All Items does exactly what the name says: it clears out all the items in the TinyDB on your phone (including other values possibly used by other apps!). This demo program does not give a warning before deleting everything – if you wish, add a Notifier dialog to ask the user to confirm the deletion. The TinyDB control is in the Palette | Storage area. Click, drag and drop this control on to your app. An “invisible” control labeled TinyDB1 appears below your app. The Add button event handler fetches the key value from the text box, converts to upper case, and then uses that as the “tag” for the value to store. That one block of code is all that is needed to store items into TinyDB. The rest of the code is user interface code – the on screen keyboard is hidden from view (it otherwise covers up the bottom of the screen) and a dialog box displays confirmation of the item being added to TinyDB. Note: Again, I used txtKeyValue, with key being the traditional name for this in other databases, whereas, App Inventor calls this a “tag”. My bad. TinyDB stores a list of all the tags we have used in our TinyDB database. We can fetch these values by calling TinyDB1.GetTags, which returns a list containing all of the tags. Our blocks code then scans through the list of tags. For each tag in the list, the code calls TinyDB1.GetValue to fetch the corresponding value. Once we now have both the tag and the value, these are combined into a tag : value pair and stored in another list. Why do we store these pairs in another list? Because to keep our code simple, we use a ListView to display the results on screen – ListView is built to display the values in a list – so we build a list of key:value pairs! The erase function could not be easier – or more dangerous! One call to TinyDB1.ClearAll does it all! A nice improvement to this code would be to add a dialog box on screen to confirm the deletion. We can do a lot more with TinyDB – such as searching the database by the “value” (rather than just using the “tag” to find items). We can also edit (change) items in the database or delete individual items. Even though each device has only a single TinyDB database, there are programming tricks we can use to simulate having multiple, separate databases. All this is described in App Inventor 2 Databases and Files. There is much, much more that can be done with App Inventor databases than can be shown in some blog posts! To learn more, see “App Inventor 2 Databases and Files“. Follow the link to see the detailed description, table of contents and to download a sample chapter. The e-book is available from Amazon, Google Books and Kobo Books. “Data structures and Algorithms” is a sub field of computer science. This sub field has developed many optimal methods of storing and retrieving data that are vastly faster than the intuitive idea of starting at the beginning of a list and going through each item until the desired item is located. We do not need to concern ourselves here with the details of how this works; all we need to know is that TinyDB and other data base systems simplify our work by hiding the details of fast searching, storing and retrieving of data. Hi, my name is Michael. Recently I started using App Inventor 2 to make some nice ‘adult’ apps. This is a great tutorial on how to use a TinyDB, as I require one for all the data being stored. Lol. Thanks. Nice one whats it called? Awesome guide! I just started trying to make apps on App Inventor 2 and I wasn’t sure how to use TinyDB until I read this! Is there a question there? Are you just starting using App Inventor or do you have some experience and you are trying to use TinyDB? Is it ok for me to use this source code for a class I’m in? It would be great for me and my partner!! Of course – all the code I post is intended for sharing and especially for learning – if possible, please give credit to this web site, just like citing a reference in a written paper. is there any way to access the content of the tiny db? as an i have the rights right? i was supposed yo do is there is registration from and as an admin i want to see those who access my android app. hope you will answer this Thank you! Not sure I understand your question – but if I do, I wonder if this would help? I wrote a free app in the Google Play Store that you can download and install and look at the content of the tinydb on your phone, assuming the db exists. Hello, I have a question for the list. How do we make a list with item that opens a new screen when it is selected ? With some code … when the list item is selected, you need to call the open another screen block. The open another screen item is locaed in Palette | Control blocks section in the Blocks editor. I have a whole chapter on using open another screen and related issues, like passing a value to and from the sub screen, in Volume 1 of my App Inventor e-book tutorial. I would like first to commend you for the excellent work and take a big question , I’m developing a project that will have a database with aproximadamento 1000 lines . Would I like to feed that data into a text file , csv , xls , any form and use the data for each column differently. But I do not know how. Database with MySQL would the ratio for primary keys with two tables would make a while or is to take the data of each field , armazenaira in a variable and manipulate the schedule. In APPInverntor , how can I do this with your native database ? As it sounds like you are familiar with MySQL and have ideas how to set up the MySQL database, I would recommend using Google Fusion tables. App Inventor does not, at this time, support MySQL. Instead, App Inventor supports a SQL-like database called “Fusion Tables” and they have launched a new feature in “experimental” mode, called Firebase DB. 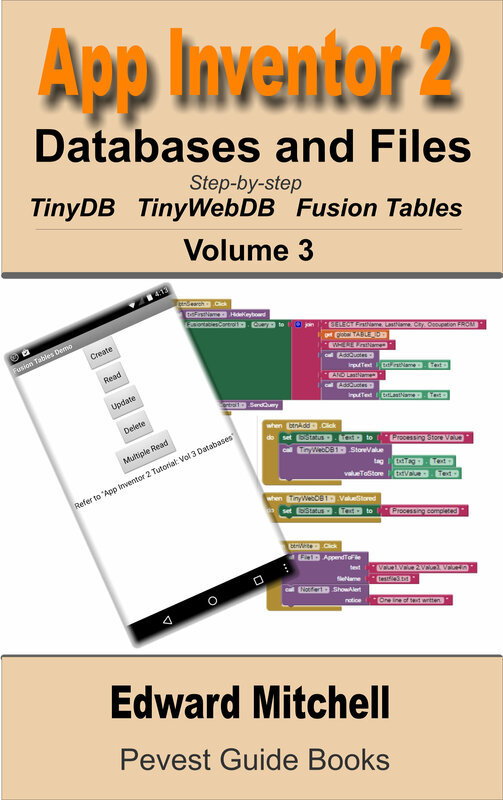 Fusion tables are somewhat complex to set up (you have to login in to a Google developer’s console to create your Fusion table, set up various linkages) and then write special App Inventor code to link to the Fusion table. The book also covers the use of text files for writing and reading, plus the use of CSV format files in App Inventor. I hope that is useful to you and your application. If I understand your question, you have an app on one phone, say Phone A, and you would like to transfer some information from the app in Phone A to an app in Phone B? In this case, to change the status of an item (a button) between the two phones. Its all about numbers logic. What If you want to create a game with options of “Save Game” and “Load Game” ….How do we use the tinyDb component? Try these tutorials for help with TinyDB – http://appinventor.pevest.com/?s=tinydb – I think that will provide you enough information to do this! Hello my name Raghunath . I have use tiny DB to store username and I am retrieving data from database but, where the username is stored .? I read some articles about tiny DB but , they have not mentioned where it will store . Although it will store in phone memory . But I want to view the username in phone memory so kindly request you to help.i want to see which folder it has stored. Basically, each app has its own TinyDB. Where is the TinyDB stored? I have not looked into that but it could be part of the app’s resources. Thanks Ed .in storage how the data will be stored in table wise or different ? I want to know where the file is ? That’s the problem – I do not know exactly where the TinyDB data is stored. Since each app has its own TinyDB database, I am thinking it is some how tied to the executable file resources. But I do not know. I’m going to be traveling for a couple of days and can not look into this until I get back. I do not know if I will be able to locate the TinyDB database on the device though. Would be interesting to know where it is.